Imagine sitting with your oldest and dearest friend some time in the not-so-distant future, when you decide to pop open a bottle of perfectly aged cabernet sauvignon. After giving the wine some time to breathe, your friend pours a glass, swirls, sniffs, sips, and says, with a sigh, "My god, it's full of stars." And you point out that it's not stars they're tasting in that wine, but meteorite. 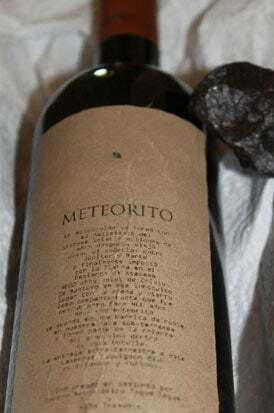 Meteorito is supposedly the first wine made from 4.5-billion year old meteorite, which puts those 150-year-old bordeaux to shame. Ian Hutcheon, owner of Centro Astrononomica Tagua Tagua in Chile, decided to combine his two great passions in a single bottle of alcoholic astronomy (or is it astronomical alcoholism?). Hutcheon infuses his wine with a meteorite that crashed in Chile's Atacama Desert roughly 6,000 years ago. He swears that this gives the beverage a "livelier taste," but doesn't say whether it pairs well with astronaut ice cream. "The idea behind submerging [the meteorite] in wine was to give everybody the opportunity to touch something from space; the very history of the solar system, and feel it via a grand wine." I'm not sure how wine drinkers are supposed to recognize the special flavor that meteorites give to red wine. But then again, I don't spend a lot of time licking the insides of French oak barrels, and I'm somehow expected to recognize that.